January 31st 2018 is definitely going to be a very special night for the moon as a rare combination of three celestial events, occurring only once every 150 years is about to take place. Some call it a super blue blood moon eclipse. Such occurrence was last reported on March 31, 1866. A total lunar eclipse will take place with a Blue Moon on the said date. The lunar eclipse happens to be the first lunar eclipse of 2018 as well. On January 31st this year something rare will happen to the moon. Firstly, the moon will be full for the second time in this month. This strange phenomenon when a full moon is observed for the second time in a single month is known as Blue Moon and occurs every 2.7 years approximately. The moon, however, does not appear blue during this occurrence. Secondly, the moon will be a supermoon. Thirdly, a total lunar eclipse will take place making the event a super rare one which occurs once in 150 years. 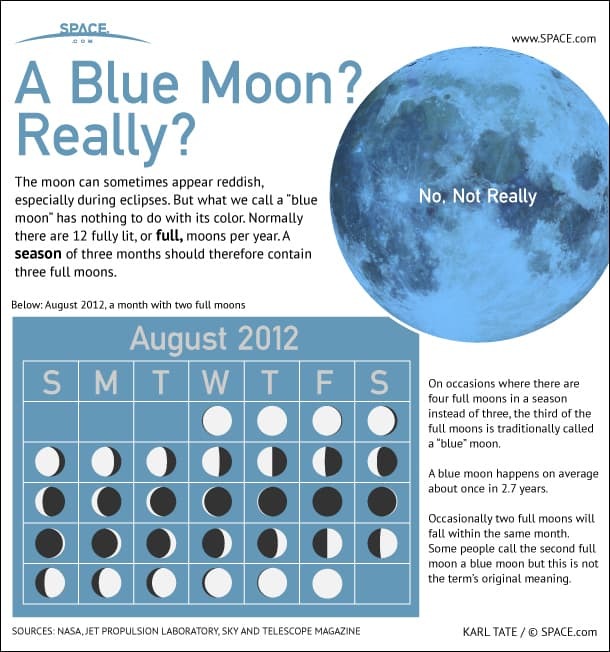 The following infographic from Space.com explains the blue moon. The event will be observed well in central and eastern Asia, Indonesia, New Zealand and Australia. Hawaii, Alaska and northwestern Canada will observe the complete event. The mid-night event will not be much visible in the Continental United States. The duration of the eclipse will be 77 minutes. In some areas, the moon is expected to appear reddish since during an eclipse, as light travels through the atmosphere, blue light is bounced off the moon's surface and red light is reflected, hence the name 'blood'. Another Blue Moon is expected to be seen late in March this year making it a really special year for astronomers and astrologers. While the former consider the event as meaningless, the latter may provide some really interesting predictions about the future as the celestial events have a special meaning according to them. Make sure you do not miss it, especially if you do not believe in reincarnation.